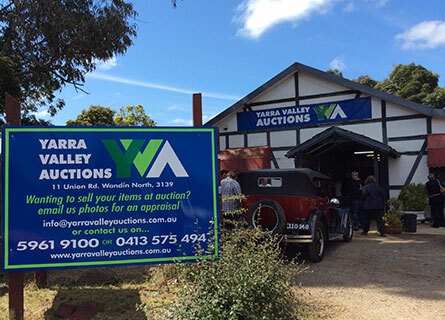 Yarra Valley Auctions Pty Ltd (YVA) is located at 11 union rd, Wandin Nth, Victoria 3139. Auctions are held fortnightly in our rooms. We also conduct on-site Farm & Machinery Clearance Sales. Yarra Valley Auctions the premier auction house in the valley. Just 10 minutes up the Warburton Highway from Lilydale (Melways reference 119 C11). Click HERE to View our Full Colour Catalogue. YVA conducts auctions every second Saturday, in the rooms at Wandin, commencing at 11am. YVA also conducts “on site” auctions including house, farm and business clearances. If you have items to auction we are always happy to talk to you.